In Short: A solid map with decent gameplay but with a slightly weak theme. This map has grown on me since I first played, and with good cause. Lighthouse is one of those maps that seems simple and plays decently, until you start looking for details. Originally I thought the theme was poor but upon further inspection I came to the conclusin that the theme is adequete. Inside it could be anything, but outside the is where the theme dwells. Lighting strikes, the beam of light from the top of the tower turns and the water seems about as wavey as it should be during a storm. Inside isnt barren of thematic details though - good use of projectors and emmiters takes advantage of the engines new features and shows the authors professionalism, whilst the windows bring a little of the outsides theme indoors. Lighting is typical late-UT style - warm yellow small lights and a blue ambient tone, with red hues where needed. Unoriginal but decent. The aforementioned projectors make up for the engines loss of shadow detail pretty well. The title tells me this is a 1 on 1 map, though I think you could stick four in and be comfortable... a large 1on1 map and a small FFA map. I wont dock points for it, because thats down to taste. It plays well, with many textbook examples of how to make a decent layout - rooms cutting into each other, places where you can predict where the players will emerge after taking a certain passageway. It has many levels of z-axis whilst keeping flow. Ammo placement is fine, as is the amount of health. Whilst it hasnt got absolutely excellant gameplay, it does the job rather well. After a couple of plays, I found the gameplay likeable though it was becoming repitive. The map is pretty clean, both mesh and bsp work lacks any wow factor but remains clean throughout. There are are some sounds though I found them a little hard to hear. Music doesnt really suite the map at all, taking away slightly from the atmosphere. Bots play ok, though I caught them getting stuck a few times. Whilst solid, I dont believe the map to be in par with DM-1on1-Alpu which has become the new standard for 1on1 maps in many ways. The gameplay isnt a gripping and suited for 1on1, and it lacks the fresh custom meshes. As such the map lacks freedom to some degree, and it does show. That doesnt take away the fact that the map is fun to play and is a solid example of a custom map - this is the standard people should be aiming for, if not higher. Fantastic little map. Really enjoy this one. But another 1 on 1 that is more exciting with 3 or 4 in there. Forking excellent map. Layout is superb. 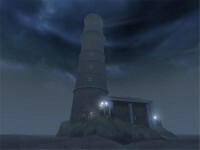 Visuals are pleasing on the inside, and I like the outside of the structure, but the terrain and fog kinda turn me off. I would have expected a bit better performance on this map on Holy Sh*t details, but its still pretty good (probably being able to see through so much of the map in some spots is bringing frames down sometimes). VERY nice!! great athmosphere - the outside bit is superb! gotta admit i tried to do sth likewise sometime ago... and FAILED!!!! detail and light placement was done with great taste. gameplay rocks!!! there are lots of cool shortcuts and areas to explore, tho it's such a small map! i wanna spend my summer holiday on that little island!! Underrated IMO. This one has great atmosphere and gameplay. Really the only thing bad, I feel, is the flow. Ouch! Anyway, a good job! Decent map. Noticed a couple of awkward things, but no major flaws. Dunno about ownage though. Not that great imo. Yeah look at the other maps on 0wnage before saying this one shouldnt be there. Nice map. Keep working. - The map is a bit large for a 1on1, so the action isn't very fast-paced. - Bots tend to get stuck on the elevator on their way to the lightning gun.